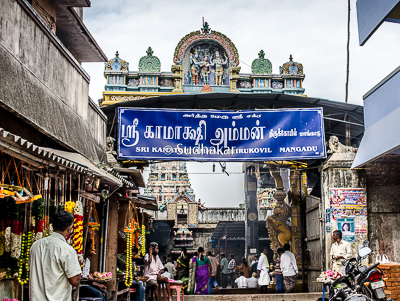 Mangadu Kamakshi Amman Temple is in Mangadu, a suburb of Chennai. Mangadu which literally means Mango forest as this village used to be dense mango forest several decades ago. Kamakshi here is known as 'Tapas Kamakshi" or the Kamakshi performing penance. As per legend this is the place where the goddess performed her penance to marry and re-unite with Lord Shiva. According to mythology, when Parvathi playfully closed the eyes of the Lord Shiva, the whole universe fell into darkness. So the Lord sent her to Earth here to perform Tapas. Parvathi came down to this place and performed penance amidst "Panchagni" resting her left leg on the sacred fire and folding her right leg. She held a Japa mala in her hand as she meditated on Shiva who asked her to come to Kanchipuram for marriage. After Parvathi left the place, the heat from the fire that she had created became unbearable for all living beings there. Sri Adi Shankaracharya is believed to have visited Mangadu and installed Sri Ardhameru Chakram (Meru) at this place. This was done to calm down the heat of the fire created by the Goddess . The Meru or 'Chakra" in the sanctum sanctorium of the temple is revered and poojas are performed regularly to this. The Temple: The temple is of Chola style of Architecture. 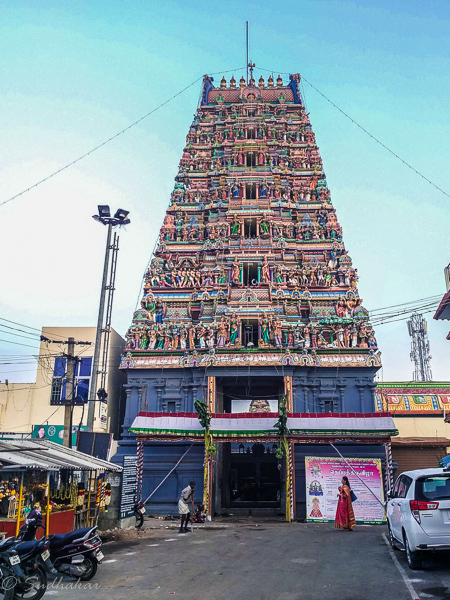 The recently constructed Raja Gopuram faces South and is seven tiered with colorful sculptures on it. As we enter the temple, we can see the Ganapathy shrine to the left of the main entrance. As walk into the main Sanctum where we can see the " Ardha Meru Maha Yantra " and the idol of Kamakshi. The Ardhameru Sri Chakram is very sacred and said to be be very divine and powerful. Only Kumkuma archana is performed and no other abhishekams are done on this Meru, as it is said to be made made of herbs. Inside the praharam we can see the sanctums of 'Tapas Kamakshi". This was installed as desired by Kanchi Paramacharya. There is a temple for Vaikunta Perumal to the south around 500 meters away. 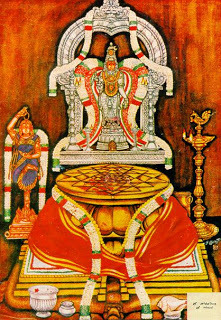 Here Lord Vishnu can be seen in a seated posture along with Sridevi and Bhoodevi holding a ring in his palm that he has brought for the marriage of his sister Kamakshi. This temple has shrines for Goddess Lakshmi, Andal and Anjaneya. Rituals The temple rituals are performed three times a day, 5:30 a.m., 10:00 a.m., 4:30 p.m. The main rituals are abhishekam (sacred bath), alangaram (decoration), neivethanam (food offering) and deepa aradanai (showing of lamps). It is staunchly beleived that devotees desirous of their wishes come to this temple on a designated day with two lemons. After darshan of Kamakshi, the devotee is given a lemon by the priest. They take home this lemon and on the same day the next week. This process of offering two lemons and taking back one will continue for six weeks. On the seventh week, the devotee to signify that he/she had completed the stipulated six weeks of visit, offers milk / milk with honey / milk payasam to Kamakshi and will offer to the visitors to the temple. It is proven that their wish would have been fulfilled by the seventh week or soon after that. Temple location It is situated in Mangadu a suburb of Chennai. How to reach? Mangadu is very well connected by road with plenty of local buses and autos,share autos plying there. From the heart of Chennai city it is around 15 kms. Other interesting places around Mangadu In 100 metres from this temple is Sri Velleswarar Temple. This is a very ancient temple and Shiva is the main deity. Lord Muruga with Valli and Theyvayanai are sculptured in a single stone and Ganesha with a mango in his hands can be seen. 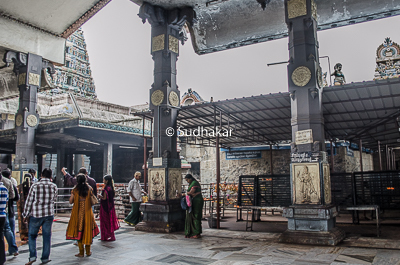 Vaikunda perumal is another ancient temple of Lord Vishnu which is nearby.